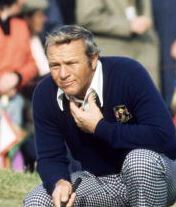 The 1973 Ryder Cup marked Arnold Palmer’s final appearance as a Ryder Cup player. Palmer went 2-3-0, losing his last match — the afternoon singles — to Peter Oosterhuis 4-and-2. In the first day foursomes, the pair of Jack Nicklaus and Palmer defeated Maurice Bembridge and Eddie Polland 6-and-5. Palmer and Nicklaus then lost 3-and-1 in afternoon fourballs to the pair of Bembridge and Brian Huggett. The second day morning foursomes saw Palmer and Dave Hill lose 2-up to Peter Oosterhuis and Tony Jacklin. In afternoon fourballs, Palmer and JC Snead defeated Brian Barnes and Peter Butler 2-up. Palmer finished with a Ryder Cup record of 22-8-2, which is the best among players with at least fifteen matches to their name. Team Great Britain was expanded in 1973 to include Ireland, although Irish players had played for Team Britain in the past. Team Great Britain and Ireland continued in 1975 and 1977. In 1979, the team was expanded to include continental Europe.